You can order your transfer to/from Prague airport quickly and easily by filling out online reservation form, writing us an e-mail to info@pragueexpress.cz or by calling +420 776 618 305. We will contact you in shortest time possible to confirm your order. 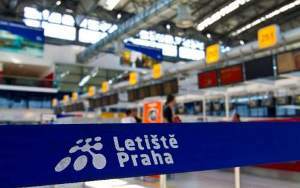 The price of transfer from Prague airport / train station is fixed and pre-agreed. The price of transfer includes transportation to any Prague hotel, irrespective of the adress, distance and route. You can pay in cash in any currency which is convenient to you (CZK, €, $). If your flight is delayed, you don't pay for the waiting time. Our driver will be waiting for you in the arrival hall with a name board. Child safety seats are provided upon request free of charge. Our drivers are professionals and speak English. Twenty-four-seven service is at your disposal. Apart from transfers to/from Prague airport/train station, Prague Express also offers transfers from Prague airport to other cities in the Czech Republic, as well as tranfsers from other Czech airports to Prague or any other place in the Czech Republic. Our rates: Prague – airport/ train station transfer by a passenger car (capacity up to 3 passengers) - 21€; Prague – airport/ train station transfer by a minibus with capacity of up to 8 passengers - 30€; Prague – airport/ train station transfer by a minibus with capacity of up to 12 passengers - 55€; Prague – airport/ train station transfer by a minibus with capacity of up to 15 passengers - 65€; Prague – airport/ train station transfer by a minibus with capacity of up to 20 passengers - 70€. Apart from services of transfer from anywhere in Prague to Prague airport and train station, Prague Express also offers the following types of transfers: transfer from Prague airport to Carlsbad, transfer from Prague airport to Marienbad, transfer from Prague airport to Špindlerův Mlýn, and other cities and resorts of the Czech Republic. And also, transfers from other airports in the Czech Republic (Pardubice, Brno) to Prague or any other Czech city. Check out our prices for transfers and other types of transportation or contact us (info@pragueexpress.cz or +420 776 618 305) to get the best quotation for your route.